I’m on my second day of diet and I should have known not to check your site, Marketman! It was agonizing not to scoot to nearby North Park for a dose of the salted fish fried rice and now this, glorious food stimulations! The weekend seems so far away (My only break from the diet will be Sunday)! This may be a silly question — but do we have similar hawker markets in Metro Manila? I recall going to one in Malaysia to buy dinner and the other people I was with were asking me if we had similar set-ups in the Philippines. Of course for the high-end crowd there’s Salcedo Market. @wysgal: The closest thing I can think of is the row of eateries at the “estero” in chinatown (Manila). “Estero” stalls still exist but nowhere near the popularity they had in the late ’70s and 80’s.And yes, they are supposed to be closed because of unhygienic practices/habits. Sad, but like you, I have often wondered why we don’t have nightly community eating places like the ones in Malaysia, Indonesia or that Hawker center in Singapore. The nearest thing I can think of is the “DAMPA” in Baclaran, Libis or the one near the international airport although the prices for cooking and eating in these are really way up there!! Interesting post…and even yummier pics!! They should bought back memories of my last Singaporean Food Fiesta in -whereelse- that teeming, cut-throat yet irresistably yummy Newton Food Circus. Unfortunately, I found out that the place is a tourist paradise(read: presyong taga to the bones!) In fact,mymost memorable experience there was, aside from the chili crabs and shrimps, was the way I my hawker tried to pull a fast one on this then first-time tourist. 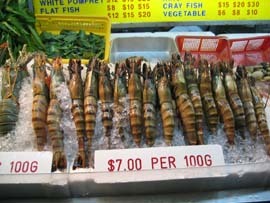 The shrimps (pictured above) was quoted as Sing $7.00 per order but turns out its for every 100 grams(or easily a piece). We were never informed of this got the shock of our Singaporean stay when we were handed our bill. My Singaporean friend had this to advice. “Never makan at the Newton lah, its for tourists!” Well, we were considered that when we visited. Next time, will try Lau Pa Sat in Chinatown. 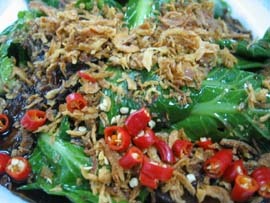 i’ve eaten a few times at lau pa sat and thank goodness i’ve never gotten any nasty surprises like that. i prefer it over newton — seems to be more organized, although the prices are about as touristy as those in newton. try the grilled stingray! great blog by the way! foodies rule! I’m boycotting Singapore and Malaysia. I dont think I’ll feel good knowing that I can get hanged for 14 oz of drugs. I mean, what if somebody slips that into my luggage? Too creepy for me. It’s too barbaric!